A sharp, stabbing pain that radiates from your hips and pelvis up to the lower back and down the thighs may be caused by your Sacroiliac (SI) joints. The SI joints connect the spine to the hips providing support and stability and play a major role in absorbing impact when walking and lifting. 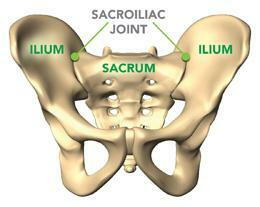 It is estimated that the SI joint is responsible for 15-30% of low back pain cases. Pain from the SI joints can be difficult to differentiate from low back pain caused by disc issues and spinal subluxations. The most common area to feel SI joint pain is in buttocks, and low back, sometimes radiating down back side of thigh. Typically felt on one side only but may be felt on both sides, the pain can range from sharp to a numb or tingling sensation. These symptoms may feel worse with sitting or sleeping on the affected side. The SI joint can become painful when the ligaments supporting it become too loose or too tight or when pelvic movement is uneven. Too much movement (hypermobility) can lead to instability in the pelvis and may cause pain felt in the low bac k/hip area and may radiate to groin. Too little movement (hypomobility) can cause muscle tension, pain and may inhibit mobility with pain being felt on one side of low back or buttocks, radiating down the back of the leg. Chiropractic is often the first line of treatment for SI joint issues and focuses on alleviating pain and restoring normal motion in the joint. Patients respond better to different approaches, so a variety of chiropractic procedures may be used such as traditional adjustments, along with muscle relaxation techniques to help minimize excessive strain on the SI joint, restoring proper alignment and function.